I would like to thank this nurse, Tim, who was working in ICU the day or so after my December 28th, 2017 surgery. I came to ICU after a grueling 12-hour surgery. The staff was working fervently to make me comfortable and manage my pain. Among other things, I needed a suction tool to rid my mouth of phlegm buildup. However, the short hose made it difficult for me to manipulate. Tim took it upon himself to look for and find a longer hose for this little tool that I used several times an hour. I told him he was my hero and that he deserved a medal! He really was....in my mind....a hero who took the time to show compassion and act on it. I wish I could've gone back to thank him personally. 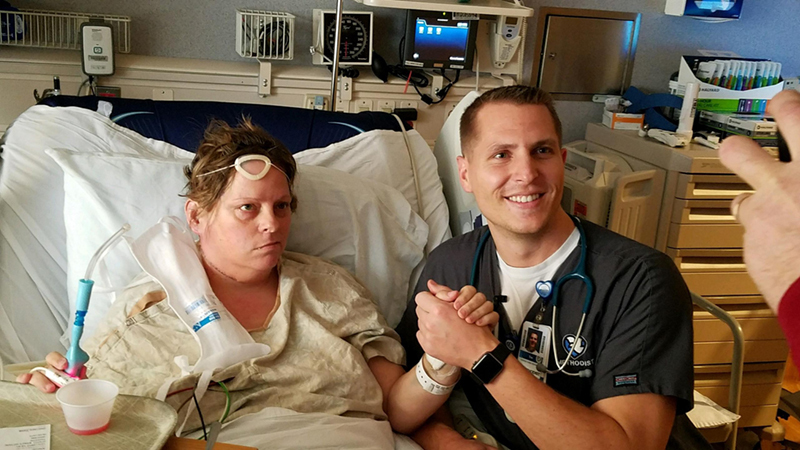 I would like for him to know that he made a deep impact on my life as I have come to realize just how special a nurse can be in the recovery process. He really was....in my mind....a hero who took the time to show compassion and act on it. Tim, if you ever get to read this, I thank you with the deepest gratitude for doing your job exceptionally well and treating me so well, despite my scars and swelling. I remember we had a conversation about the YouTube sensation, "Dude Perfect." You said that you'd heard of them and so to cheer me up you tried to do a few "Dude Perfect" moves. I'd call you Nurse Dude Perfect...because you are the perfect nurse!